It’s not difficult to become proficient in functional medicine if one is being taught a sound model. The key is finding and learning this model, which fortunately is provided by the Future of Functional Medicine Review Clinical Newsletter. Today we speak with Dr. Joe Mather who has “built the foundation of [his] practice on this approach”. We share keys for success in functional medicine which are highlighted from the newsletter and evidenced by Dr. Joe’s success in practice. Dr. Michael Ruscio, DC: Hey, everyone. Welcome to Dr. Ruscio Radio. This is Dr. Ruscio. Today I’m here with Dr. Joe Mather. And we’ll go to our conversation in a second. This is kind of a pre-recording. My intro on this episode got a little bit cut off. So we’ll start with the interview here in just a moment. And it’s kind of midstream. So I just wanted to give you a preface. But essentially, Joe is a practicing physician who has been applying the concepts that we cover in the Future of Functional Medicine Review clinical newsletter in his practice. And he’s really seen some remarkable improvements in his practice, his ability to help people. Functional Medicine – Who to learn from? Keeping testing minimal and focused helps practitioners focus on the most important variables rather than introducing so many that it’s unclear where to start. There are also financial benefits to the patient in this approach. 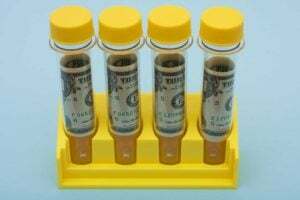 Too many functional medicine practices run $5k worth of testing right out of the gate. And also ironically, even though the Future of Functional Medicine Review is not written to help someone build their practice per se—it’s not like it contains any marketing techniques specifically—he’s found being able to offer people cost-effective solutions for their healthcare to be quite an effective marketing differentiating factor for him. So we talk about his transition from conventional medicine into functional medicine, which is very interesting, and then also what he’s learned from the review. And he shares some great clinical pearls and lessons. And we have a discussion about functional medicine, our newsletter, philosophical points in functional medicine that are very important, where to learn, how to learn, who to learn from, who not to learn from. And we kind of reaffirm some of the concepts that you and I’ve discussed on the podcast for a long time now—and when I say you and I, I mean the audience and myself—that less is more, often. And you don’t need to reach for more exotic. And it’s just great to hear another clinician who has just been following our clinical newsletter, applying those concepts and coming to some of these same cathartic realizations where you can get better results for less money with less effort and more efficiently. And I also want to remind you again here briefly that if you are a healthcare provider—even if you’re a layperson who wants to learn how help themselves with functional medicine, the Future of Functional Medicine Review clinical newsletter is a monthly publication where we go over case studies, very in-depth case studies with protocols and testing recommendations and interpretation data, as well as summarizing for you research studies that are…As we talk about in this episode, there was one study, the Rome consensus on SIBO breath testing… it took me probably 4 hours to take this complicated overview of how the Rome Foundation recommends using SIBO breath testing to create a series of easy-to-digest bullet points so that you could get all the take-homes in about 7 minutes from what took me probably 4 hours to put together. So there is a lot of value here. The point I’m driving at is if you sign up for access to the Future of Functional Medicine Review clinical newsletter any time during the month of September, you will receive your first month of access for only $1. And so this is a special I run every once in a while for our audience and for our audience only so that you can have a look at the newsletter. And if you feel it’s something that can help you, then hopefully you’ll stay on as a subscriber and learn and help us kind of turn the tide of functional medicine. And so with no further ado, we’ll start into what I have found to be a very educational and enjoyable conversation showcasing some of the best techniques in functional medicine as the field grows. And hopefully this method of “less-is-more functional medicine” really starts to take off. So with no further ado, we will start into the episode. Yeah, I was thinking we can just kind of talk about what you’ve learned, what you’ve applied, and how you’ve been able to just use the information, whether it be case studies or research study summaries in your practice, and how these things have helped you. Because I’m really trying to showcase to people who—especially people who have heard the review and have said, “Ah, I’ll look it up later,” or maybe, “I’m too lazy to look at it.” But if they knew the amount of utility it delivers, they’d be more motivated to pursue it. And it seems that your actual, I guess, your case study and your own application could be a good way to move them. DrJM: And honestly, I was so glad I found it when I did because I’m about 2 years, less than 2 years into my practice, and I really just built the foundation of my practice on your algorithm and protocol. And it’s just been so helpful. DrJM: So maybe I can start this off as I’m a family practice MD practicing out of New Orleans and really first became interested in functional medicine towards the end of my residency. I remembered as being so frustrated that my patients weren’t getting better with conventional tools. And I just had a sense that there was more out there, like a lot of people who kind of find this. Once I found functional medicine, I just dove in. Consumed probably a dozen books and any trainings that I could find, a bunch of podcast and interviews. I ended up practicing in New Zealand following residency, for a year, to just get that experience and just kind of reflect on ways that the medical system could be better here in the United States. And I think that’s when I first came across your podcast. And I admired how you practiced medicine for a while. So when you opened up the training, I just jumped in and kind of have been doing it ever since—dove into functional medicine. There are a lot of different approaches out there. And it’s really easy to get lost. There are so many different perspectives kind of vying for oxygen and different techniques. And everyone is really marketing and yelling about how you should be treating patients. But I kept coming back to the gut. It’s kind of the centerpiece of how to get patients better. But I wasn’t finding great options out there—practical, clinically-based recommendations—until I found your training. So that was kind of the big picture of how I found you. And it might help a little bit. So I practiced in New Zealand for a year. And I came back and worked urgent care for two years to save up money for a private practice. And at that time, just looking for the best guidance on how to form functional medicine. I wanted someone who wasn’t out in space in their recommendations. That was important to me. And I really didn’t want to reinvent the wheel. I wanted to get results quickly with my patients. And I found that through your guidance. DrMR: And so that’s a good question point. Because I’m now, boy, I’m about 8 to 10 years removed from being a new—just having had graduated and trying to figure out where to learn. What do you think for the practitioners—and I think this would apply to practitioners of all stripes, all the way from the health coach up to any kind of doctor. But what do you think is the big things clinicians are wrestling with in terms of there is all these different courses out there? How do I adjudicate which one is helpful and which one—and pardon my lack of tact with this comment—but is just someone who couldn’t really do, so they’re teaching instead? What would you offer someone in that situation? DrMR: For those not familiar with the acronym, can you break that down for them? DrJM: IFM is the Institute of Functional Medicine. And AFMCP is their foundational course. It’s a five-day course on site where it brings probably 20 different lecturers on different topics, kind of big picture functional medicine conference. And each of those, they kind of organize it in different topics. But the end of each lecture was just supplement after supplement, probiotic, vitamin C, B complex, stress reduction, zinc, magnesium. And it’s very easy to get lost and think that you need to use all of those tools to get patients better. So I think a lot of functional medicine practitioners don’t know where to start because there hasn’t been enough focus on a foundation. DrMR: Yeah, I mean, that makes a lot of sense. And there’s this quote from Bryan Tracy, which I’ve shared before, which is, “Never get your schooling from a person who makes a living selling education.” And so, it’s very befitting. And I think one of the things people need to be on the lookout for is, sometimes an educator—and they can be very well-intentioned and what-have-you—but they may have a very big name. And a big name doesn’t always equate to a good clinical model. They could be very big for pointing out a certain issue and make it have—there could be a lot of notoriety or a lot of interest in that issue and, therefore, they’ve developed a big name. Some of it can just be marketing. Some people don’t have a very well-developed message but they’re very good marketers. But the point I’m driving at is, somebody can have a big name, can be popular on the internet, but isn’t necessarily a good teacher. And that was one of the things that I learned early in my career. Where one of the most iconic lecturers at the time, still fairly iconic lecturer this day, I very quickly had the sense that this guy was all smoke and mirrors. And I’ll be a bit poignant here in this comment, but some of the lecturers that get elevated to the top of the lecture circuit are the best at selling supplements. Which is why the supplement company pushes them to the top of the list. And it’s not a dig on supplement companies. But a degree of that does happen. Now, that can be done in a virtuous way. You can be very effective in selling a clinician on a method that also involves testing and supplements. And that could be completely accurate and evidence-based and in the patient’s best interest. But it can also happen in a way where there’s just the success, where there’s too much testing, there’s too much treatment. Or as you’re pointing out, Joe, there’s no philosophy to help guide you on using these tools discerningly rather than just kind of haphazardly applying them to everyone. So, I mean, those are just a few things that I noticed early on in my career that kind of helped me navigate the landscape. And the follow-up point to this is I really appreciate how you descale the supplements at the end of a treatment. Because once you fundamentally heal the patient and you restored balance to them, many times a lot of the things you needed in the initial phase of treatment is just no longer needed. They’re better. They’re healthier. And that has saved my patient’s time, money, stress. And it makes me feel good not feeling like I’m hawking supplements. Because most of us, we go in this to heal patients and to work with patients. We don’t want to feel like we’re bought by a supplement company or just in this to sell supplements or prescriptions, for that matter. So that’s been a very helpful and refreshing point that you’ve brought to functional medicine education that’s lacking. And how can I do that? Well, the most practical way is just to drive this process empirically. Meaning, do we see an improvement in someone’s symptoms. And if we are, then that supplement is having a desired effect. And so, we’ll keep it on. And that discernment right there is powerful in and of itself because you don’t keep someone on supplements that are doing nothing. But then if you follow that even further, what ends up happening is, once the effect has been established and has been maintained for a few months—I think, one to two months is reasonable—then you move to wean them off these things. And what happens there is not only do you get them on the minimal effective dose, you save them money and what-have-you, but some patients will notice they felt better on it. And so, now, patients aren’t questioning recommendations. They firsthand have felt, “Yeah, I need this.” So what ends up happening is your compliance goes way up because people don’t start taking themselves off of stuff because they feel like, “Well, I’ve been on this for a year. When am I going to come off?” You’ve helped try to guide them to realizing what they need and what they don’t need. And it’s a very nice position to be in as a clinician, like you said, where you don’t feel like your hawking anything. And people are really looking to you to guide them through the process. And it’s a process you can feel really good about. DrJM: I agree. And none of us have to be in the field for very long, either conventional or integrative medicine, to have a patient come in on 15 to 20 supplements that they’ve either gotten from one practitioner, which is ridiculous in and of itself, or that they’ve just accumulated from seeing multiple different practitioners. And oftentimes these people are just frantic and feeling like they’re dependent on these things. It can be really powerful if you have the philosophy of prioritizing what is most needed and just letting them take 10 bottles away. That can, in and of itself, be so healing. DrMR: Exactly, exactly. We’ve outlined it in a few case studies. And I know of at least one that is coming to the forefront of my mind. But there’s likely more than just one where the predominant point of victory for this patient’s case was discovering that they were taking a supplement that they were negative-reacting to. They hadn’t discovered that. And yeah, this was the bile-supplement reaction that was presenting as what looked like a SIBO relapse. And I write in my comments at the end of this case study, can you imagine if I didn’t pick out the fact that her diarrhea and abdominal pain were due to the bile she was taking? We could’ve gone on—and probably not me. But in the model, they could’ve gone to hydrogen sulfide or deeper testing for what-have-you. And then treat it and not responded to the treatment. Because, of course, the treatment wasn’t treating an actual thing. The actual cause was the bile. And so, swinging away from the person who has the most exotic bells and whistles approach, back to realizing that the fundamentals here can be so powerful. DrJM: I hope so. I hope so. Hey, everyone I’d like to tell you about BIOHM, who helped to make this podcast possible. Now, BIOHM offers a line of gut-healing products, including a probiotic, a prebiotic, and a green powder. Now, their probiotic is interesting in the sense that it combines strains from both category 1 and category 2. So from category 1, you have lactobacillus acidophilus, lactobacillus rhamnosus, and Bifidobacterium breve. And from category 2, you have S. boulardii, so a nice combination of category 1 and category 2. And if you go over to BIOHMHealth.com/Ruscio and use the code RUSCIO at checkout, you’ll get 15% off your first order. So BIOHM, they’ve got a good line of probiotic and prebiotic and the greens powder, all to help you improve your gut health, which we know has such massive and far-reaching impacts. So check them out over at BIOHMHealth.com/Ruscio. DrMR: Let’s talk about, is there a case study or two that you’ve seen where you’ve applied some of the concepts that we’ve covered in the review? And share some of your own specific experience with what you’ve applied. DrJM: Of course. When I was preparing for this lecture, I was thinking actually one of the first patients that I saw from a gut perspective, that I said, “Hey, this is someone I’m going to start trying this on.” Because as a young practitioner, we’re trying different approaches and seeing what sticks. And that’s part of the reason that I’m so enthusiastic about your work is because it works. I remember there’s a very sweet lady in her young 40s, she came to see me. And, man, chronic headaches, joint pain, insomnia, and then just awful diarrhea. I mean, this is something that we really see quite commonly with SIBO. And it’s pretty common, I guess, with a constellation of complaints. So I basically started her on a low FODMAP diet, probiotic. I didn’t use a fiber at that point. And I said, “Okay, try these two things and if you’re not feeling better…” Then I gave her two herbal products. And I hadn’t heard from her. And this was early on in my career and so I was looking for feedback. Like how is she doing? Did she do okay on the diet? Do I need to do more for her? And it was several months later where I saw her for her annual visit. And she was just completely better. Didn’t need anything else. And so I said to myself, ‘okay, this is something worthwhile diving deeper’. And I think that the deeper I’ve gotten, the better results I’ve gotten. And being able to simplify the approaches has just been a whole lot of fun, honestly. I get good results with autoimmune disease. Saw a guy with horrible plaque psoriasis, it was probably covering 80% of his surface area. And he’s had this for decades. And after a month of some herbal antibiotics, he had cleared up by 50%. So autoimmune disease, I’ve seen very good results. DrMR: In this case, had you performed testing or did you feel that the testing wasn’t needed and you just used the herbals empirically? DrJM: I did do a breath test on him. DrMR: Okay. So he came back with SIBO? DrJM: Yeah, yeah. He had mixed methane and hydrogen SIBO. DrMR: Got you, okay. And both of those are great case studies. And it really is interesting. It’s like, okay, but that doesn’t mean we have to do everything. What that means is we have to work our process in a sound fashion because too much can thwart your ability to piece together cause and effect, meaning someone comes in and they’re feeling better or they’re feeling worse. If you’re doing too much, you can’t connect the cause and effect. But if you’re doing only one or a couple things and you’re trying to reduce variables, you can make those connections. And those connections are important because a lot of clinical practice, in my estimation, is really figuring out, from the available breath of treatments, what works for that individual and learning their system. And so if you get someone well with the shotgun approach, that’s okay today. But if a year later they’re regressing, that means you have to do the entire shotgun again. Whereas, if you had pinpointed, ‘ah, this person, the diet didn’t really make any difference; but when we escalate it to anti-microbial therapy, that’s what did it for them’. Now, we know if they have a regression down the road what one piece to use from the puzzle of kind of the functional medicine matrix. DrJM: I can’t tell you how much I agree. This is, to me, the most important thing I’ve taken away. Because I think this is—your review is the Future of Functional Medicine Review. And the shotgun approach is both inefficient. It wastes time. It wastes money. It creates a ton of anxiety. And I think it’s the biggest problem facing functional medicine today and in the future. It really needs to change if—for those of us who believe in functional medicine as an antidote to our broken healthcare system and actually getting results for people, this is the first thing in functional medicine that has to go. We can’t have adrenal testing, gut testing, breath testing, SpectraCell or nutracell, NutrEval analysis, and then look at a patient after $2000 and say, “Okay, where do I start?” It’s irresponsible, quite frankly. DrMR: Agreed. Or have all that data and then do the same thing that we’re advocating in the Future of Functional Medicine Review, which—you’d be surprised how often people do so much testing to only do a very simple treatment regime that could’ve been done without the testing anyway. DrJM: It’s really unfortunate. Patients come in to practitioners’ offices either demanding or expecting or—it’s hard. I’m not sure why people do this. Honestly, I don’t have a good answer. DrMR: And you make a good point, which is the culpability falls partially on the doctors and partially on the patients, right? If the patient is really demanding these tests, then part of that is on the patient. But I think the majority of the responsibility falls on to the provider. Because as I’ve said before, I probably spend 30% of my time in my clinic talking people out of a test they think they need or a disease they think they have. So I think both parties are guilty. Both doctor and patient. But, really, I think it’s ultimately the responsibility of the doctor or the clinician to talk the patient out of unreasonable expectations and into a more practical paradigm. DrJM: I agree. I do agree. I found that patients are oftentimes relieved if I tell them, ‘hey, look we’re going to start here and if this doesn’t work, we’ll go to our next step’. They feel like they’re being guided through a process and I have control over. I find that creates a lot of relief. And a lot of times when I tell them, “Hey, look, we don’t need all that testing. We can start simple and see how much improvement we have and then go from there.” I do think they appreciate that. And I think that’s been helpful in me growing my business, is that patients get a sense that I want to be responsible with their money. DrMR: Yeah. I think that’s worth echoing because I think there was this heyday—and maybe heyday is not the right term to use. But there was this high point where people felt that the way that they could sell their practice or their clinic or their technique was our comprehensive testing. And when you frame it like that, people think, eh, okay, maybe I don’t need all that. Maybe I’ll look for the guy who’s going to be a little bit more reasonable. And I’ve certainly seen in my practice patients literally thanking me on day one saying, ‘oh, I almost went to this clinic and they wanted me to do $5000 worth of testing on day one. And I’m so happy that I found you because your test bill was $1100 or $700 or whatever it is. And again, it’s not to say that anyone who’s performing a lot of testing is doing that with a malicious intent. But I think there’s a more efficient way. So I’m glad that you’re finding that as something that’s kind of a selling point, for lack of a better term. DrJM: Yeah. I mean, I wanted to highlight that point specifically because I do think that the Future of Functional Medicine Review has been helpful to me as I grow my clinic. Not just clinically, but those pieces I think helps give the clinician an idea of some of the things that are important when marketing and working with patients apart from just the nuts and bolts of clinical medicine. DrMR: Right. And people will trust you. I’ve really found that when you don’t just jump on the bandwagon along with everyone else, when you have the gall to say, “Well, I know this is what everyone else is saying, but it may not be in your best interest.” I think people really appreciate that. Because it’s hard to go against the grain. It’s harder to go against the grain. It’s easier to just follow the party line. But for those people who are willing to stand up against—going against the grain, I think that does build a level of trust in their eyes, in terms of if you’re the person that they should see or they should refer family and friends to. DrMR: I think we’re agreeing on all these points. I want to bring us back for another moment. If you have any other insights that you’ve picked up from the case studies or the research studies that you’d like to share with people. And a big, again, motivation behind me doing this podcast was trying to help articulate to people who may be struggling with, well, it’s $20-30 a month for this paid subscription to the newsletter to articulate to them that…Obviously, I’m biased. But you really get way more than your money’s worth and this can help give you a drip every month to guide you and prevent you from falling into kind of this functional medicine excess model. DrJM: Yes. So I think I’ve already said how important I think the case studies are to kind of get in your mind about what’s most important when addressing the gut. And maybe just one more quick point there and then I want to talk about our review articles. But what I’ve really been impressed by is the emphasis for fundamentals. And how much mileage I get on just focusing on that. And when to scale off. And what to consider next. So not jumping right on to maybe a low histamine or low sulfur. But experimenting with that after you haven’t gotten where you want to go with the fundamentals and when to think about an elemental diet. So it really is a pretty thorough and detailed model when you really, really dig into the case studies. But you’re also getting review of really pertinent articles. And for those of us who believe that, to be taken seriously, functional medicine really needs to rely on published evidence when possible. This is really critical. When you’re talking to other physicians, when you’re talking to educated patients, you really need to know why you’re doing what you’re doing. And for example, you broke down the recent wrong criteria for SIBO breath testing. And just that, in and of itself, just so incredibly important. I mean, I treat a lot of physicians and just being—when they hear they’re wrong, and like, oh, okay, wait, there’s some weight behind what you’re saying here. It’s not just a speculative new test that may or may not pan out. It’s very important. And so that’s been very helpful to have quick reviews of studies that are pertinent and helpful to patients. DrMR: So the breakdown that you get of the Rome consensus criteria for breath testing, that took me hours. DrJM: That’s worth $20-$30 that we will never get. DrMR: I mean, because you have to read all of this and then you have to contextualize. You have to really focus in the things that are most relevant to a practicing functional medicine clinician. And I also alter the language. Because sometimes the language that is used is super circuitous and then hard to make heads or tails of. And so that one specifically burns out in my mind. Because it’s not only maybe an hour to read the paper, but then to go back and pull out all the pearls. And then to lay them out. And I pay attention to is it a bullet? Is it a sub-bullet? Is it a chart? To try to make it as easy as possible for you guys when you’re reading through it to say, ah, here’s the consensus of the Rome report. And I just got that in seven minutes rather an hour and a half. DrJM: It’s so boring. Yeah, that was—thank you. That was excellent. I appreciate the work. DrMR: And also to your point, when you understand the consensus, I think it’s very helpful. The Rome consensus regarding SIBO breath testing is just one example. Now, you can have a very educated conversation on the pros and cons of testing. If you have someone come in who, let’s say, they’re health enthusiasts. And they think they need to do a SIBO breath test every three weeks to monitor their progress. You could say, “Well, that may be a little bit overzealous.” So you can kind of help guide people based upon the evidence and really be that reasonable Sherpa helping them guide the process. And again, that really, in my mind, I found helps to build your credibility in the eyes of your patients. Because now, they’re just learning to filter all of their recommendations through you. And of course, that can be easier to obtain if you can have the research studies broken down for you so you can read the study in seven minutes rather than an hour per study. DrMR: Were there any other study summaries that kind of come to mind. I’m wondering—I’m actually curious. 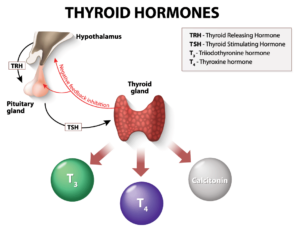 We’ve talked quite a bit about thyroid hormone. I’m not sure if this is something that you’re using much in your practice. But I’ve laid out some guidelines that may be a little bit different than what you hear in standard functional medicine. So any thoughts on thyroid? DrJM: That’s really interesting because our endocrinologist in town that I ask him, like, “Hey, are you using Armour?” And he’s, “Oh, yeah, yeah. I think I have two patients on that.” And you’re like, “Okay.” And then you have a typical functional medicine patient coming in and telling you that only Armour or only Nature Thyroid. And of course the truth is probably somewhere in the middle that the different formulations are fine for different patients. I’ve appreciated that perspective. Before your review, I didn’t know that there was liquid Synthroid available. So that, to me, was pretty interesting. And the absorption of that was probably going to be better than tablets. I haven’t gotten around to trying it yet. But that, to me, is very good information. DrMR: Especially if you’re seeing patients with chronic digestive involvement. That’s when that option, I think, should be exercised. And when I say “that”, that scenario would be someone who even at their best, still has a degree of digestive involvement. And I know that we like to think in very optimistic terms sometimes in functional medicine. But there is this reality that I’m sure most clinicians are familiar with, which is the severity of illness. Some people have been dealt a tough hand. And I use the example often of inflammatory bowel disease. For some people, keeping their colon is a win. But they’re still going to have some symptoms. And they may still have a degree of malabsorption. Or potentially someone with short bowel syndrome, who’s essentially had a component or a section of their small intestine removed previously. And now, you can’t really do anything about that. These people may be prone, even at their healthiest, towards malabsorption. And so they may flounder and struggle with thyroid hormone until you make one easy switch of getting them from a tablet to a liquid. I don’t think we have really the comparative data. But this should also apply to a T4 plus T3. Because the issue is not conversion of T4 to T3. It’s just absorbing the hormone to begin with. And so if you give them a tablet of T4 or a tablet of T4 plus T3, the absorption is impaired irrespective of what’s in the formula. And so, that’s an important thing to kind of keep in mind. And in one of the most recent issues, I lay out a basic algorithm for when to consider T4 alone. And then when to consider upping the dose of T4. Then when to consider T4 plus T3. And then when to consider liquid T4. But anything else on thyroid you wanted to touch, Joe? DrJM: The most important, I think, review was the paper talking about the amount of TPO antibodies and when to worry. This is just an issue that comes up again and again. People are near panicked about TPO levels of 75 or 40. And having that paper in front of me that I can point to patients and to show them outcomes data, is just very, very helpful. Saying, “Look, if we get you below 500, this is a win.” And I found that that is just incredibly calming for a lot of my patients. Because there’s a lot of fear-based marketing, unfortunately, around Hashimoto’s and autoimmune disease. And that, to me, I’m just thankful for being shown that study. That one’s great. DrMR: Good. And it’s been very helpful for me. Because these are things, I think, most clinicians—at some point, you kind of have to scratch your head and say, boy, this person has gotten to a point where they are very healthy. At least they’re presenting very healthy. And they’re getting time in the sun. They’re taking vitamin D. They’re exercising. They’re meditating. They’re eating a healthy Paleo-like diet or what-have-you. They’re taking some probiotics. And they’ve improved. All their symptoms are gone. Their skin is clear. Their joint pain is gone. Their IBS has cleared up. But these antibodies are at 117. DrJM: They think they’re sick. DrMR: And they think they’re sick. And how damaging that is. And so I just try to look these things objectively. And when I actually look at some data, it turns out that you can make a pretty strong case. That if your antibodies, or TPO specifically, is in the lower hundreds and the patient is healthy, then that’s a clinical win. And that can be, as we’ve discussed previously, hugely freeing for the clinician and for the patient. The clinician doesn’t feel like they have a sick patient that needs to be doctored any further. And the patient isn’t walking around feeling like they’re ill and finding themselves drifting to a Google search three times a day about Hashimoto’s and really doing themselves this huge disservice of just stressing themselves out about a condition they don’t even have. DrMR: Cool. Well, Joe, this has been a great conversation. I’m glad we had a chance to connect. You’ve been one of the more active users in the comments section of the review. So that’s how I knew to reach out to Joe. Because I said, this guy’s really thinking through this stuff and asking some very probing questions. 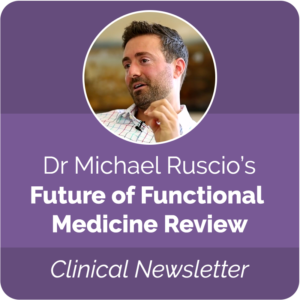 So I thought this would be a nice chance to give people a different perspective into The Future of Functional Medicine Review. Anything that you want to leave people with? And then please also tell people, if you want to share your website or anything else, for them to be able to find you on the internet. DrJM: Yeah. I think just for people thinking about if it’s a good idea to sign up. I think the people most likely to benefit are either those who are new in the field and want guidance on where to start. They’re a little overwhelmed. I think this is just a fantastic review for those. And then I think if someone who’s more experienced in functional medicine but just isn’t getting the results that they want on their patients, I would suggest diving right in and just working through the concept with your patients. I think you’ll find get better quicker than you may think. And if people want to contact me, they can find my practice’s website, it’s DoctorMather.com. And they could find me on Facebook, which is facebook.com/jmathermd. DrMR: Awesome. Well, Joe, thank you for taking the time. And I guess I’ll probably talk to you in the comments section of the review here in the near future. DrJM: Absolutely. This was fun. Thanks for this informative episode. I’ve spent thousands of dollars on functional medicine docs in Denver and I’ve gotten nowhere.